Danville, Ky. – British writer and tea historian Jane Pettigrew has joined forces again with American tea writer Bruce Richardson to chronicle the fascinating story of tea’s influence on British and American culture, commerce and community spanning nearly four centuries. These two leading tea professionals have seen first-hand the current tea renaissance sweeping modern culture and have written over two dozen books on the subject of tea, including the most-used tea reference book, The New Tea Companion. No beverage has shaped Western civilization more than the ancient elixir - tea. In this new expanded edition, readers follow tea's amazing journey from Canton to London, Boston and beyond as these two leaders of today's tea renaissance weave a fascinating story detailing how the leaves of a simple Asian plant shaped the culture, commerce, arts and politics of both the United Kingdom and the United States. Danville, Ky. – Louisville's acclaimed 21c Museum Hotel launched locations in downtown Cincinnati and Lexington recently and both properties asked Elmwood Inn Fine Teas to supply teas in their restaurants. Chefs at Metropole (Cincinnati) and Lockbox (Lexington) approached owner Bruce Richardson to design their loose-leaf tea programs and come up with signature 21c house blends. Both locations chose their own unique house blend that meet the needs of their local customers. Richardson also provided training so that the staff could feel comfortable talking with customers about which tea to choose to accompany a meal. Servers also learned steeping techniques for a variety of black, green and caffeine-free teas. Tea sales at both locations have steadily climbed as more and more well-traveled diners are turning to tea as their hot beverage of choice. Boston, MA. December 9, 2011 Bruce Richardson, one of America’s best-known experts and tea sommeliers, has been named the official Tea Master for the new Boston Tea Party Ships & Museum. For over 20 years, Richardson has traveled the world discovering and cataloging tea's incredible history. His travels led him to writing, photographing, and sharing his experiences at tea, literary, and historical events across the country. As Tea Master for the Boston Tea Party Ships & Museum, Richardson is in charge of designing a line of historic teas for sale in the gift shop and in the 100-seat Abigail's Tea Room that sits atop the Boston Harbor museum. The historic teas will be based on the Chines teas that were thrown into Boston Harbor on December 16, 1773. 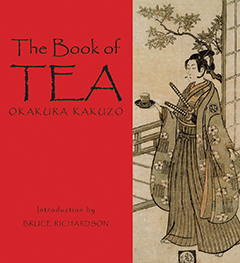 Both Georgia O'Keeffe and Frank Lloyd Wright attribute much of their art spirit to the original The Book of Tea, written in English in 1906 by Okakura Kakuzo. He was born in a Yokohama silk store in 1862 and educated by American missionaries, Harvard-trained professors, and Buddhist monks. With one foot in the East and one in the West, he helped save many of his country's art treasures during Japan's rush to embrace Western culture at the end of the 19th century. Okakura was appointed head of the Asian Arts Department at the Boston Museum of Art in 1904, where he discovered the best way to introduce the East to the West was through the common metaphor of tea. It would be hard to find a more fascinating character than this mysterious wise man who became Boston's high priest of art, spirituality, and the unique Japanese concept of teaism. His captivating life crossed paths with countless luminaries of the Gilded Age and he was the guest everyone — especially women — wanted at their dinner parties. Bruce Richardson has edited and illustrated this classic work for a contemporary audience who see tea as a way of life rather than a commodity. Dorothea Johnson and Bruce Richardson love to share the observation by the head waiter at London’s famed Ritz Hotel who says "He can always spot an American because they have their pinkies gloriously raised to the gilded ceiling as they sip their cup of Earl Grey." Johnson and Richardson address that misconception and other frequent “tea faux pas” in their new edition of Tea and Etiquette: Taking Tea for Business and Pleasure. Johnson is the founder of The Protocol School of Washington and Richardson is an American tea blender and author of numerous books on the subject of tea.